Transport Tycoon Deluxe ported to the GP2X. code go to the PSP port author: Jaime Penalba, thanks. - Cleaned up window placements of difficulty settings and patch configuration. - Fixed cut-off text and windows in newspaper articles. to be mouse clicks instead of the usual Control/Shift keys. This is to answer a request from a few users. - Touchscreen support added for F200 users, including left-handers. - Cursor movement speed has been reduced slightly, but now speeds up when the START key is held down. - Added hotkeys for landscaping tool, zoom-in/out, auto-rail tool, and transparency toggle for buildings/trees. - Sound buffer size reduced to 256 bytes to fix sound lag. - Over a dozen scenarios are now included. Be sure to read the included README.TXT for installation requirements and control layouts! This game requires the original data files from Transport Tycoon Deluxe. It is most compatible with the Windows version's data files. This will not run on my 1.2.0 firmware with SDL libs installed. Is it just me? I haven't tried this on earlier firmware, either. Guys, did you read the readme.txt file? You have to go get the TTD data files and install them separately. This ran okay, however the interface doesn't work well, in its current form, on the 320x24 display. Many windows are drawn too far off screen, the tool bar takes up nearly 25% of the top half. With a little more work, it'd be perfect. This game is perfect! Almost worth the price I paid for the GP2X in itself. Just one small suggestion, maybe the viewports could move automatically when the mouse reaches the border of the screen? I believe that would make moving around much easier. Thanks for the awesome port! I dont get it. Those files i need in the openttd directory, where do I get those? This is a great port and exact in everyway. Which is the problem as the gp2x screen is tiny. Scrolling is difficult but it's still good fun. 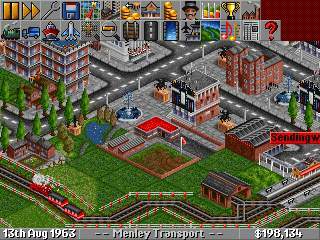 Goto https://www.tt-forums.net/viewtopic.php?t=3407 to get the files you need for Openttd. oh and do you need sdl libraries? OpenTTD RC4 is out. Can we get an updated GP2X version? RC4 just came out? Updating! Thanks for the heads up! Btw, if you have downloaded Build 1002 and your having trouble laying track, download it again. I updated the build 1002 files with a quick fix for it. I forgot to handle right-clicking properly for moving around the map. The best part about this is that within 10 minutes of downloading it, I'd improved the graphics quality by increasing the resolution to 640x480 (also makes slightly more stuff fit on screen). It was a while back now so I'll have to dig through my copy of it, and find what I changed, then I'll post a little step-by-step to help y'all do it. Looking forward to an updated release of this. I tried this and the B button (zoom out) didn't work. Also the game was permanently stuck scrolling right. I found it unusable in its current state: shame. I can buy boats and (just about) planes but trains and buses I can't because the dialogs are too tall and the Build Vehicle buttons are inaccessible. Can you not enable dialogs to overlap the menu bar as I believe it would solve this issue. For me it didn't take long to realise that Select and Start would've been much better as left and right mouse buttons. For some reason I kept pressing A for the left mouse button, possibly because my right hand is idle. The A/B/Y/X left/right/up/down navigation is nice but you can also do this holding RTrigger (right mouse button) and moving the joystick. It would be nice if you could make these buttons configurable (in a config file) because I would've found it a lot easier to have LTrigger to zoom out, RTrigger to zoom in, A as LMB with B as RMB. Then to navigate somewhere quickly I can simply tap LTrigger to zoom out, hold B and move the joystick and then tap RTrigger to zoom back in. This then frees up Y and X for something else e.g. they could toggle the visibility of the most often used dialogs such as Landscaping or Railway/Road Construction which again could be configured by the user. This is an amazing display of the capabilities of the gp2x, for sure (IMHO). Pretty fun game as well, although it takes some figuring out. I wish the graphics/scrolling issues were fixed... some of the dialogs requires side scrolling etc... but not a big deal overall. I like it, two thumbs up! Thank you for porting this. 1/24/08: TTD2X Update! Build 01-24-08: - Codebase migrated from 0.5.0-RC5 to latest OpenTTD stable release, 0.5.3 - Touchscreen support added for F200 users, including left-handers. - Cursor movement speed has been reduced slightly, but now speeds up when the START key is held down. - Added hotkeys for landscaping tool, zoom-in/out, auto-rail tool, and transparency toggle for buildings/trees. - Sound buffer size reduced to 256 bytes to fix sound lag. - Over a dozen scenarios are now included. Just got the latest build ... nice work. As a massive OpenTTD fan, the only thing that stops me actually playing it is the fact that I can't change half the options that I want to because of the menuing difficulties. When you have to use "select" (close all windows) to get rid of the patch options, it's not good. Any changes you've made take effect that way. And the toolbar would be better off even if it was just scaled by half... you'll still be able to select menus. I'm dying to play this game on the GP2X, so I'm not knocking the world that's already been done, but it is basically unplayable even if it is tantalisingly close! I think the toolbar works fine and I find the game is perfectly playable as is. However, I do agree the options windows need work and we'll see what we can do about them. ledow: For now, why don't you set up your games exactly how you want them on your PC using 0.5.3 OpenTTD, save the game, and then load and play them on your GP2X? ledow: To configure patch settings, you can use the same idea, load 0.5.3 OpenTTD on your PC, set up the patch settings exactly how you want them, then copy and paste the sections you changed into the openttd.cfg on the GP2X. Make a backup of openttd.cfg first. That's what I've done but it makes it a royal pain in the backside. I even have seperate scripts to do the job for me for different option "profiles", copying over particular .cfg's depending on the mood. It's still a pain when a nice-in-game config menu is all-but-useless, though. build 020108 Great port, the only problem is that sound stops working when exiting and then starting it up again. I have to either restart the system or start another program with sound, exit, and restart TTD. Other than that it works great. qwerty15: I don't know what to tell ya, it works fine for me on both my F100 and F200, never had that problem with sound at all. If other people report it, I'll look into it. TTD2X Updated: Feb 1, 2008: Holding control button will allow you to drag oversize windows, allowing access to patch configuration and difficulty settings. Also added UNICODE multi-language support, added cheat hotkey: A+B+X+Y, added new command line parameters to set cursor movement rate, triggers as mouse clicks. Awesome Work! Was always one of my favorite games. Would really love to have support for a USB Mouse though. Other than that, perfect!